This week is a two-part look at how Kyle Shanahan uses the run-pass option (part one) and how he uses the running game to set up the RPO and take advantage of the aggressive pursuit of opposing defenses. 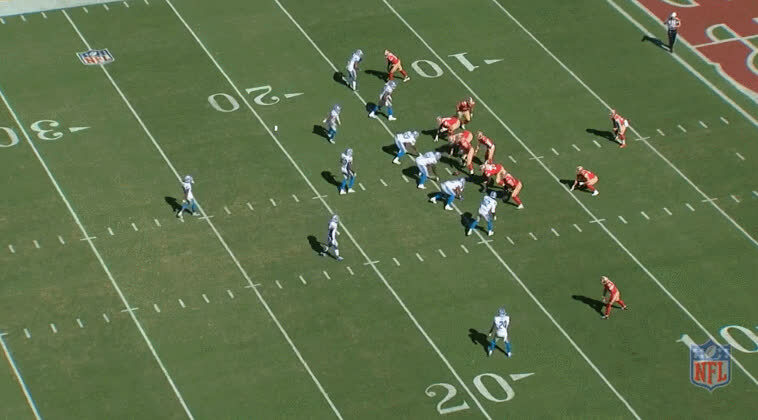 Part two today looks at how the 49ers used the run to set up the RPO. In yesterday's article we took a look at head coach Kyle Shanahan's usage of everyone's favorite play: the run-pass option (RPO). In there we saw a variety of ways he employs the RPO, utilizing both the pre-snap and post-snap read RPOs (for more on those, see the hyperlinks by The Athletic's Ted Nguyen and also follow him here on Twitter). Today we're going to look at how the RPO was employed to take advantage of an overly aggressive Lions defense this past Sunday in Week Two, a game the 49ers won 30-27 on the strength of their running game and setting up crucial throws in the 2nd half on much needed scoring drives. This season is only two games old and we're already seeing more and more pieces of the Shanahan offensive puzzle come together. 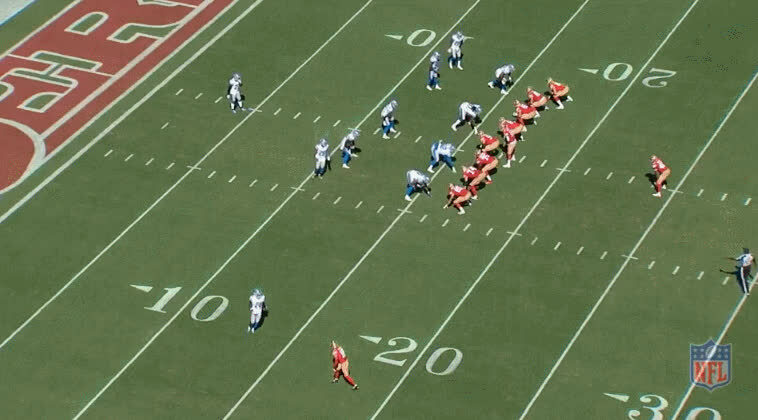 Briefly, we looked at the pre- and post-snap RPOs in yesterday's breakdown. The pre-snap read RPO has two components, the box count and the ratio read. The box count read counts defenders in the box and tells the quarterback to either hand off to the running back or throw the pass route, usually a bubble screen or quick slant. If there are more blockers than defenders, the pre-snap read is to run, if there are more defenders than blockers, the read is to pass. In the ratio count RPO, the quarterback simply counts the number of defenders covering the receivers up to a certain level or depth of coverage. In the post-snap RPO, the quarterback is reading a defender, usually a linebacker, to determine what his read is. If the linebacker drops into coverage, the quarterback will hand the ball off. If the linebacker comes up to fill a gap on the run, the quarterback will pull the ball out on the fake and throw the slant into the area vacated by the defender. Coach Shanahan employed a number of post-snap read RPOs in his time as offensive coordinator with the Redskins as he utilized quarterback Robert Griffin III's strength as an option scheme quarterback and to get him into a rhythm early in games. Since leaving the Redskins, Shanahan has employed mostly pre-snap read RPOs since he has had less mobile quarterbacks and using the pre-snap read RPO fits more into his offensive philosophy. That philosophy was on display on Sunday against the Lions. Shanahan's offense works together like a puzzle where every piece builds off the last to reveal a clear picture of his game plan on any given game day. This past Sunday against the Lions, it was clear the goal was to get the running game going and then build off that success. Right out of the gate on the first drive, the offense ripped off a 28-yard gain with Matt Breida on the outside zone. Soon thereafter, with the running game imposing its will on an aggressive Lions defense, Shanahan hit it with a series of RPOs on key scoring drives. To set up the RPO though, we'll need to go through a few of the preceding plays that gave Shanahan and the offense an indication of how the Lions defense would play the run and subsequent RPOs. With the 49ers in 21 personnel (two running backs, one tight end, two receivers), the 49ers are running a toss crack to their left. The Lions indicate they are playing a zone coverage shell when fullback Kyle Juszczyk motions out of the backfield out wide outside the numbers. The motion leaves a box count of five defenders on the left side of the box from the center over to the in-line receivers, a total of five offensive blockers. Breida takes the snap behind a pulling Joe Staley (no. 74) out on the edge as receiver Pierre Garçon cracks down on the defensive end and receiver Dante Pettis (no. 18) works to the second level safety. On the backside of the play, tight end George Kittle (no. 85) is actually running a quick slant pattern into the middle of the field, but with the box numbers matching the play side blockers, the easy call is the toss, which goes for nine yards. Kittle's assignment, however, is key. Two plays later, the 49ers offense comes right back to the play above but flips the formation and assignments. The play call is the same toss crack play as above but this time they've substituted out Breida for Alfred Morris (no. 46) and are running it to the right from the far left hash and Kittle on the tight end slant. The Lions, not to be fooled again, this time notice the same formation and throw an extra defender to that side of the formation to stuff the toss play. This time they line up with a box count read of six defenders from the center over to the offense's right to give them some leverage. 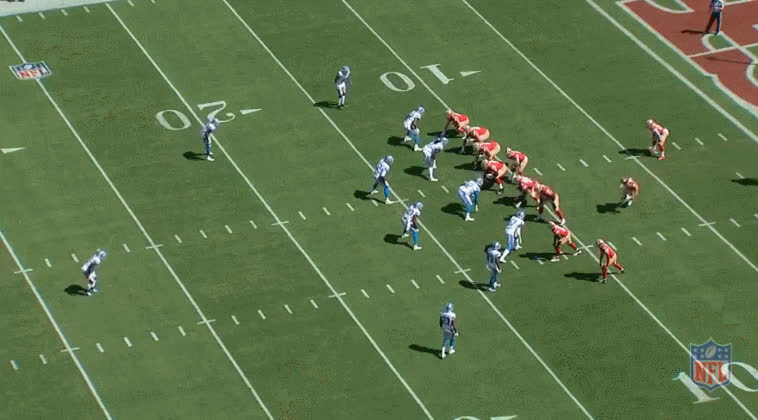 But the box count tells Garoppolo to go with the pass instead of the run as Kittle is going to run right into the void the defense left for him, thus putting the Lions into conflict and showing why the RPO can be so effective at putting defenders into conflict. Kittle goes out on the quick slant/pop route over the middle into the void left by the defense as they chase the toss play. The backside defenders get caught flat-footed as they are expecting to have contain assignments on anything that cuts back against the grain. This springs Kittle open by about three steps and leaves an easy toss and catch for Garoppolo. However, Garoppolo rushes the pass, doesn't set his feet, and delivers a throw over Kittle's outstretched hands. What would have been an easy 15- or 20-yard gain falls incomplete but shows the way in which Shanahan's offense works in sequence to play off of a defense's tendencies. After a kickoff return for a touchdown by returner DJ Reed was negated by a facemask penalty on the return man himself, the 49ers began the drive deep in Lions territory. The 49ers are in 22 personnel (two tight ends, two running backs, one receiver) and are running a simple outside zone to the right with Morris. The 49ers are looking for two things specifically on this play: what does the backside end do and what does the backside linebacker do. They're looking to see how each defender reacts to the run action on the backside of the play and how the defense aligns itself. The backside defensive end is in the 6-technique defensive line spot so he'll be looking to two-gap anything that comes his way. Since the run goes the opposite way, he crashes the the C-gap in between the tight end and left tackle. The outside linebacker in the B-gap off the ball will be looking to fill any gap that opens in the middle of the offensive line that the running back could potentially cut back into. The tight end on the backside, Kittle, does not go out on a route. The run goes to the right and Morris hits the "bang" read of the outside zone between the #1 and #2 end men on the line of scrimmage. The defenders on the backside, however, give the 49ers another key: they are going to crash hard on the backside to contain the line and prevent a cutback. Three plays later the 49ers were set up in the red zone. The 49ers come right back to the same exact formation except that the third tight end on the depth chart, Cole Wick (no. 89), is lined up to Kittle's left. The flip in personnel along the offensive formation causes the Lions to shift the 6-technique lineman from the play above to the 3-technique spot between the guard and tackle and dropping an outside edge defender outside tight end Garrett Celek (no. 88) for backside contain. The box count read suggests that the 49ers should pass the ball since they have only five blockers to the strong side to account for six defenders. Garoppolo makes the right read. As Celek releases down field, Garoppolo does the quick run fake to Morris and turns right away and fires a pass to Celek, whose route caught the defender flat-footed at the snap. Garoppolo plants the ball right in the numbers and Celek makes the catch and drags two defenders with him into the end zone for a touchdown. The third and final sequence we'll look at didn't occur on the same drive but nonetheless gave the 49ers some clues as to what to expect when your opponent lines up in a certain way. The play call is a fullback lead zone out of 21 personnel again. The fullback lead zone utilizes both gap (power/counter) and zone-blocking concepts to create an extra gap along the offensive line. Tight end Garrett Celek starts out on the right side of the formation and is motioned over to the left. The defender follows him over, indicating man coverage, which will be an important factor the next time they visit this play. The play goes off as a simple running play, but as you can see, there is a considerable void behind the defense as it reacts to the run. At this point the Lions probably figure the 49ers are trying to control the clock and run it out. However, a good coach never shows his cards. Neither receiver runs a pass route on this play but they would on the next drive, the game's most important scoring drive in the 4th quarter. This drive would become the most important and crucial scoring drive of the game for the 49ers as it would eventually lead to the field goal they'd need to put the game out of reach. The 49ers motion to the same formation as the play above, indicating to Garoppolo that the Lions are in a cover one man-free defense. The play call is the same fullback lead zone as above. They confirm what they want. The box count remains the same with the motion, five on five and they could just as easily run the ball, but the man coverage indicates to Garoppolo they could probably pick up more yards with the quick slant in the void left by the man coverage. At the snap, Celek, whose pre-snap motion put him on the strong side of the formation, runs a sift block back across the formation and pulls his defender out with him. The void behind the linebackers opens up for Garçon. On the quick slant, Garoppolo sells the fake just a quarter of a second longer as Garçon's route develops over the middle. He delivers an accurate strike and Garçon picks up 19 on the play. Several plays later Robbie Gould kicked what would eventually be the game winning field goal. This is just one small piece of how effective Kyle Shanahan can be as a play caller and we can expect him to build off this in the coming weeks to open up the offense even further. All gifs courtesy of the NFL.